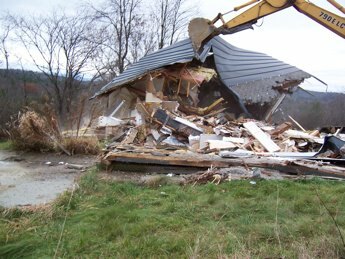 Before I share some awesome shots of house demolition, I need to expiate my guilt by going over the factors behind our decision to wreck. For three years, we tried to figure out how to salvage the unsalvageable. As I mentioned in my last post, we had pretty much everyone who has ever held a hammer in the region and many who have not, come through to give advice about whether we could save “Old Gray”. As one person after another dug into the walls to examine the skeleton of the house to see if we could peel back to the bones and rebuild, it was hard to miss the fact that there was basically no skeleton. To give an example of the poor craftsmanship of this house, the 2″ x 6″ roof rafters were three feet on center. In our house our roof rafters are 2″ X 12″ and are a foot on center. 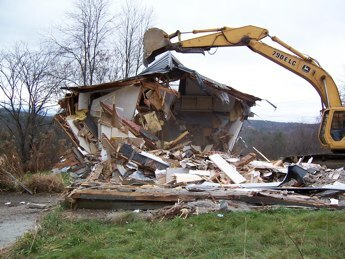 Basically, what this skimpy building style meant was that when our friend Scot MacLeay put his excavator scoop on top of the roof of Old Gray, she quickly fell down. And even as Scot worked to keep the floor intact during demolition so that he wouldn’t have to scoop up extra stuff from the basement, in the big part of the building, the floor immediately collapsed. Moments later, as rotten carpeting was removed, the floor was revealed to be made of something resembling thick cardboard, resting on collapsed punky cross beams held up by rotten logs in a swamp hole. Perhaps I have indicated sufficiently why no one wanted to salvage anything from this house, even when everything was offered for free. So, after three years of paying $3,000 taxes on a house no one could safely spend an hour in, let alone inhabit, it was time to let the whole thing be carted away by some nice guys wearing shirts that said RECYCLE on them. What exactly they meant by the phrase, we did not ask, though the amount of inspections and hoop jumping involved in getting permission to have these guys take the house away made it clear that it was all very legal, if also very sad that a whole house could be of such little value as to be destined for dumpsters. The truth is, that while I thought I used clothe diapers on my four kids in order to keep our landfills emptier, I was really just saving space for Old Gray. As the house seems mostly to have been made of vermiculite insulation and paper wallboard, I hope it will compost down as well as those diapers would have. Maybe even better. But let me leave wishful thinking behind to cheer you up with some action shots. 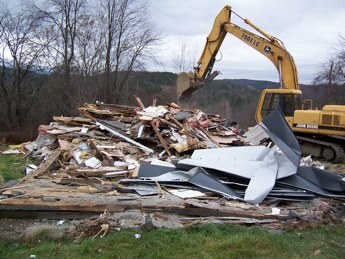 Scot’s first couple of swipes brought down one end of the building. The white powder filling the air was ground paper used for insulation in the walls. It kept blowing in on Scot in his excavator, making for less than pleasant conditions. Jim and Will left school during lunch hour to visit with Scot. Jim had considered spending a summer taking the place down stick by stick with help from Will. Here they agree what insanity that would have been. William wants me to point out the toilet holding strong on the second floor. When Scot got down to the foundation, the nicest part of the building, he pulled out the rocks for us to reuse. 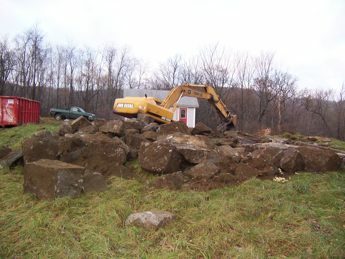 Within hours of demolition, local stone masons were at the site angling to buy the rocks, even going so far as taking pictures for their “files”. We politely declined all offers on the rocks as we do want to use them eventually for whatever happens here on this land in the future. 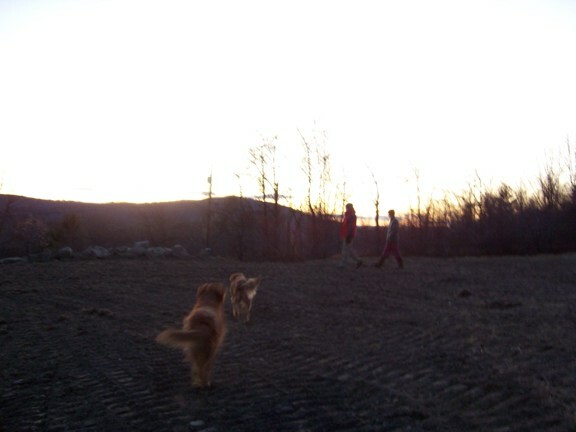 Maybe one of our kids will build here someday? Plans for Ben to camp out in the place were mercifully scraped years ago when he got free housing with his teaching job. In the meantime, I hope to plant the whole spot with flowering Thyme. It will be a gift to our bees and somehow feels like the right way to thank “Old Gray” for having been all that she could be. If you have been reading this blog since its early days, you may recall that a number of years ago we bought some land down the road from the farm. It had a little gray house nestled in its abandonned acreage. And this house, the subject of today’s blog, proved to be a classic example of the Potemkin effect. This phrase was coined when Russian Czarina Catherine took a trip down the Volga after her Prime Minister and lover, Grigori Potemkin, conquered the area. Because the region was in complete and sorrowful disrepair, Potemkin built fake happy villages along the river, full of frollicking actors, all to give the Empress a completely false impression of surface wonder in a region of actual chaos. In a much less important way, this was what the gray house we bought was all about. The gray house looked fabulous from the road. If I had a nickel for everyone that has said to us in the last few years, “Why isn’t anyone living in that cute little place?” well, I would have a lot of nickels. With its perky standing seam roof and hideous but intact plastic siding, the place looks like a cream puff, but its been a potemkin effect cream puff and a complete nightmare under this prettified outer shell. 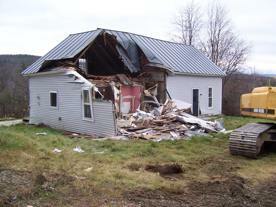 To back up twenty years, Jim was the contractor for building our house. We had two carpenter friends help frame the house with Jim. Then Jim, with help from his dad and uncle, went on to do the plumbing, wiring, insulating, floors, finish trim, shingling….. When we added onto the house with our barn, Jim built it with his brother’s help. When we built our big Green Hope Farm addition, Jim did it with the help of Ben. As frequently remarked around here, Jim has not taken his nail belt off since he met me. One perk of all this endless activity is that Jim now has a vast legion of friends in the building trades. They offer moral support for every building matter that needs to be addressed and every building conundrum. 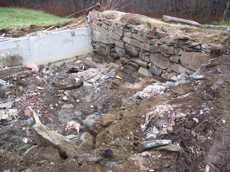 So when builder friends of Jim’s heard we were considering buying the property, everyone wanted the complete tour, even though this was literally taking your life into your hands when you went in the crawl space under most of the house to examine the broken sills and joists. Anyways, everyone survived the tour to weigh in with their two cents, all of which was the same two cents. With a broken main carrying beam, roofs under the fake standing seam ones that slumped like a sway back mule, a small river flowing through the dug basement, a chimney collapsed into this basement, no insulation, floors rising and falling like dunes in the Sahara, no wiring or plumbing to speak of, mold everywhere, and no TLC given to the property since 1970, everyone agreed that the building was going to have to come down. 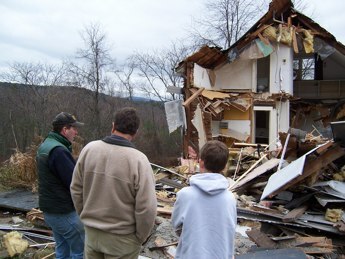 So we bought the place knowing it was really for the land, but still hoping we could somehow tear down and rebuild the house in pieces right where it was. More friends returned for more visits, because it really is a classic crap building. Everyone in town seemed to know the combination lock on the crap door, 3435, and people, sometimes people we hardly knew, would call with commentary. None of it suggested that anything was salvageable. Ben moved his potter’s wheel into the old living room, but found the terrible mold smells made work in the charmless space impossible. Slowly, slowly, the talk shifted from trying to rebuild sections while leaving other sections in place to finding a way to take the whole place down. We kept hoping some punk would toss a lit cigarette into the building, because the red tape to get the fire department to burn the place down was beyond imagining. For several years, Jim contemplated taking it down piece by piece by himself, while I have advocated something less taxing to his shoulders. We were at an impasse, which the town enjoyed as even getting the tax accessor into the basement didn’t seem to convince him that the building was uninhabitable. He couldn’t get enough of that standing seam roof and nice plastic siding. If you have even read a few blogs, you know that Jim is the brakes and I am the gas, most of the time anyways. 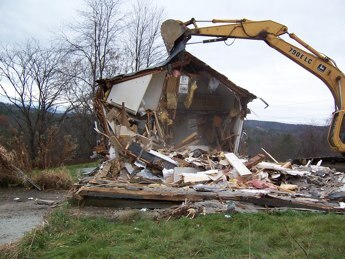 But a small miracle happened on 11/11 when Jim suddenly decided he was tired paying taxes on a fake house and that he would call his excavator big machinery friend for ideas about a swift removal. 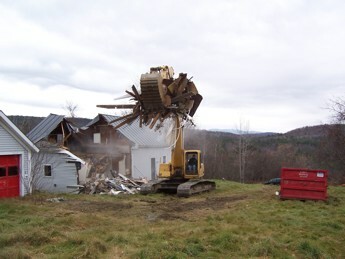 The friend had his excavator free and called people to bring big removal bins to the land immediately. In fact, about ten minutes after Jim called his excavator friend, Scot pulled into our driveway with a big happy grin on his face. This was the moment all Jim’s friends have been waiting for! Jim too, I suspect. I can hear his shoulders sighing and his heart too. So I am off right now to see the whole thing go. 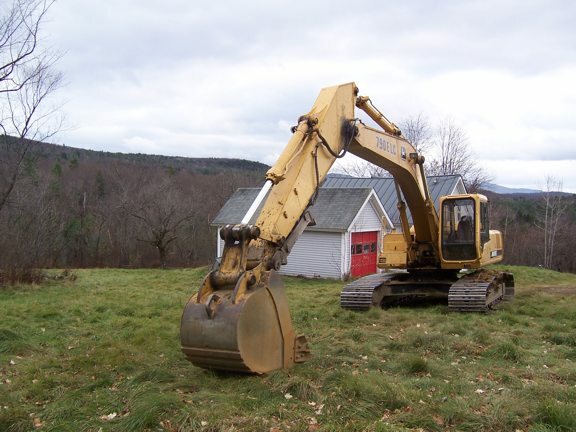 Here the machine that is going to take care of old Gray with the little garage which we are saving in the foreground. May she rest in peace. In this wonderfully diverse country of ours, there are many things to disagree about. But on one thing, I think we can agree. The White House is a good place for a first puppy. Why? Because puppies need a lot of staff support and the White House staff is just about big enough for the job. To prove my point, let’s stop to analyze staffing needs for some ordinary cats and dogs, say those here at the farm. In our office, we need six people on the day shift and four people on the night shift to minimally take care of the needs of the resident two dogs and three cats. First there is the staff needed for door opening. During the day, these door opening demands fall squarely on whomever is closest to the door (Sophie) or whomever is most attentive to May May’s various methods of getting our attention (Jane). This is important because May May takes at least twenty sixth trips outside each day to see what has happened since she was last outside four minutes before. And the cats? They need at least one more trip outside than May May each day, because let’s face it, cats are the real alpha dogs in any household. And door duty at night? We all take turns. It’s Jim’s job. As far as the first puppy goes, he or she will be blessed with door people at all 412 doors in the White House. That’s an actual, certifiable, fun fact about the White House. There are 412 doors for the first puppy to get people to open. Not a bad gig for a dog. In addition to the pleasure provided by having so many humans waiting to open so many doors, the first puppy will also have the pleasure of truly gourmet canine cuisine. Here at the farm we need a battery of imaginative chefs and nutritionists for canine and feline banquets. Sadly, we bumble along with a reduced staff of just two of us, me and William. And dinner ain’t always pretty as a consequence. But the first puppy will have five full time White House chefs at his or her beck and call. Five. That should be enough. At Green Hope Farm, we need at least three people to supervise the dogs’ lunchtime walk and at least one person for their afternoon run. Our dogs frollick in the woods, not in the well manicured Rose Garden, so theoretically we have less pooper scooping to do than the first puppy’s people. But Jim’s contention is that May May and Riley save everything for the most visible spots on our lawn. So we let nature take its course it’s Jim that scoops. At the White House, there will be a multitude of available staffers assigned to walk and run the first puppy, as well as follow behind with a pooper scoop. In winter, our dogs and cats need lots of windows to look out and lots of couches to jump on. Even the beds have come into play lately, because May May has begun to sleep on a guest bed. She actually puts her head on the pillow (Please don’t tell our Thanksgiving guests this or they may bring their own sheets….or decide not to visit). The first puppy will have 132 rooms in which to find the most comfortable couches and beds and ample staff to clean the sheets or slipcovers when the first paws are muddy. The first puppy will also have 147 windows from which to admire the view. Sometimes the first puppy will be watching things like the presidential helicopter take off from the south lawn. Sometimes the first puppy will just be checking out the squirrels. Again, there will be ample staff to clean any windows drooled on during squirrel or helicopter observation. Here, the window washer is named Jim and there are squirrels but no helicopters. In the country, we worry about our animals getting eaten by coyotes or fisher cats at night. No one Jim does not sleep until the cats are in for the evening. We depend on well trained whistlers Jim to gather our feline troops at dusk. For the dogs, we depend on well trained leashes handlers Jim to take the dogs out one last time at night, then bring them back in too. While there are probably not a lot of coyotes on Pennsylvania Avenue, I imagine the first puppy will also need a last call in the gardens before being ushered into the safety of the White House each night. Last time I checked, the White House had a lot of people handlers on staff. Some of them will be lucky enough to now morph into the much easier job of dog handler. On winter evenings we gathered around our woodstove with animals flopped on top of all of us. For the first puppy, there will be 28 fireplaces to choose from for quiet family evenings. Probably like here, the first puppy will prefer lying on the male head of household when particularly wet or muddy. Probably like here, this will happen especially when the male head of household is particularly clean and dry, say, ready for a state or PTA dinner. So to sum up. White House staffing for the first puppy should be ample. BUT, were Jim here he would want to add his own caveat to my conclusion. PS St. Jim asked his sixth grade class what they would name the first puppy if they were in charge. Their suggestions included Lincoln, Liberty, Abe, Freedom, Springfield, Rosa, Selma, Tubman, Harriet, Martin, Hope, Robinson, Lucky, and Mr. President. Let’s face it, that last choice is probably the closest to reality. The first puppy will be in charge of everyone at the White House. Just ask May May when she wakes up from her nap in time for her home cooked dinner. She’ll agree with this assessment.